Palmpring organic mattresses are made with four simple, organic, all natural ingredients; latex, coconut fiber, wool, and cotton. We don’t use any other adhesives or toxic chemicals, so you know exactly what you’re getting when you buy from Palmpring. What exactly is coconut coir, and how is it made? 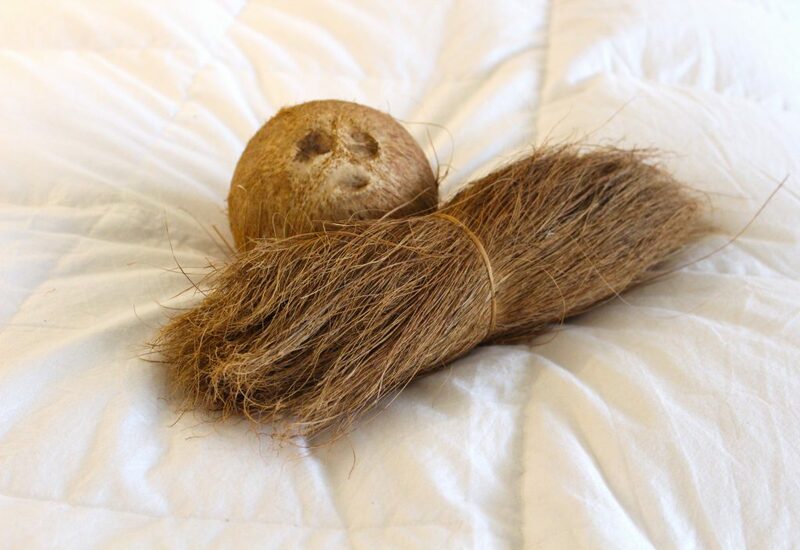 The first step in making coconut coir is harvesting fiber from coconuts. We source our organic coconut husk fibers from farmers who have already extracted the coconut oil and separated the inner nut from the remaining fibers, which have been washed, combed, beaten, and dried. The only solvent used in this process is water, so we avoid the use of artificial chemicals every step of the way. These discarded coconut husks are often considered “waste” in other coconut material industries. Simply by using the husk fiber in our mattresses, we’re helping to reduce waste and save the environment! If we didn’t use them, the coconut husks would likely be burned or relegated to landfills. 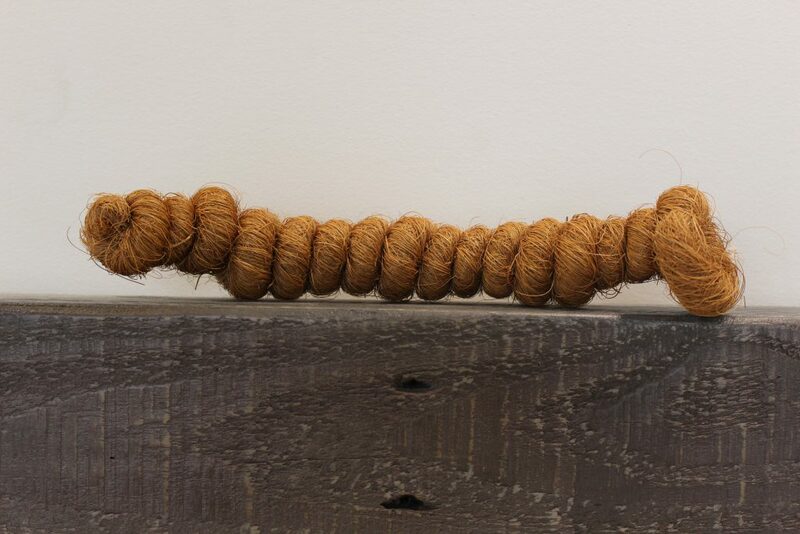 Once the coconut fibers have been washed and processed, they’re woven into thick, heavy ropes. This part of the process is crucial, as it gives the fibers a natural spring that supports your back and makes metal springs obsolete. The coconut fibers spend several months twisted into rope form, so that they can acquire their bounce naturally without chemical help. But, that’s still not the end of the journey for our coconut coir. Finally, our coconut fiber needs to be flattened and coated in organic latex. Over a period of a few hours, we rubberize the curly fibers so that they don’t become brittle and fall apart, but become extremely resilient to absorb shocks and weight, similar to the action of a metal spring. After spraying rubber milk onto the dried fibers, we steam and press each layer of fiber in order to form a mattress pad. Each layer is tested and inspected to ensure the highest quality. Then, the pads are cut into rectangular shapes and readied for mattress production. This process takes less than 1 day. These finished coconut mattress pads are incredibly sturdy, and can’t be easily bent. That means that every pad is carefully shipped flat to our factory in Los Angeles. 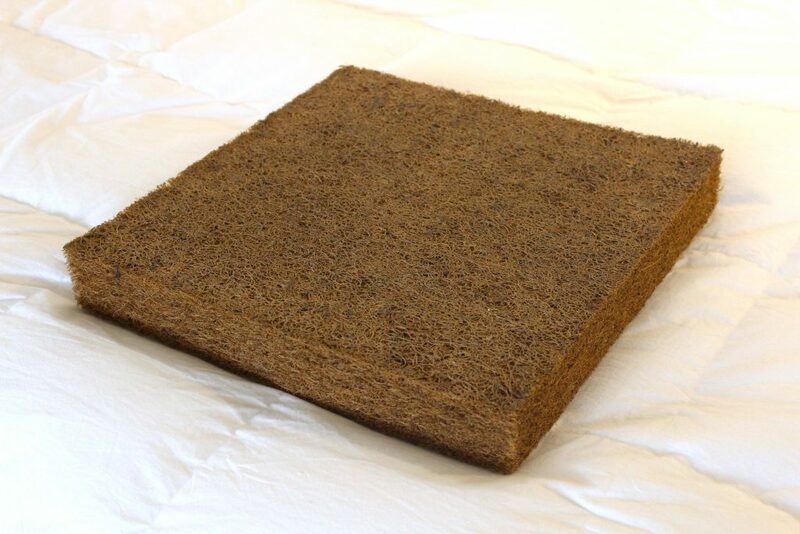 Coconut coir sets Palmpring apart from the rest of the mattress industry, and its incredible properties make our mattresses more than just a great organic mattress alternative. One major benefit of using coconut coir in our mattresses is support. Latex can be made in various densities, but it just can’t give you the same firm support that our layers of coconut can. Additionally, they make a great substitute for metal springs, providing a bounce while evenly distributing your weight. Another major benefit is longevity. Metal springs can poke you or wear down. Our rubberized coconut is incredibly durable, as is our organic latex. Palmpring has been around for over 20 years, and we still have mattresses from all the way back at our start that still look the same inside. Other great benefits include heat and moisture resistance. Memory foam mattresses tend to absorb and retain a lot of heat, making your bed uncomfortably hot during the night. Our mattresses sleep cool and comfortably. Another issue that a lot of other mattresses have is moisture retention. A moist mattress inside can foster mold growth and attract insects. Water easily travels through our coconut fiber, allowing it to evaporate, and the coconut naturally repels germs, bed bugs and other insects. These same properties are also super useful in shoe insoles to wick sweat and keep your feet from stinking!